Apparently a fake version of the final installment of the Harry Potter series, "Harry Potter and the Deathly Hallows" was floated onto the net, two days before the official launch of the real one i.e. written by Ms J.K. Rowling herself. Since the original book wasn't release, I couldn't know for sure if it were the real deal. It came in PDF form and was password locked. It took me 2 days to get passed it and started reading it fervently. A check with Ollie, who had bought the real book, i.e. "What was the first word that Snape said?" and "What is the last sentence?" and I realised that the one that I downloaded was a fake version. By then, I was already 10 chapters into the fake one. Thereafter, I left the forgery at that and proceeded to read the real version and it wasn't until I finished the real one before I return to complete the rest of the forgery. Why would I want to read the fake version, even after knowing that it was a forgery? Well, where all credit is due, it was surprisingly well written and a very entertaining read if I may add. Why would someone write a fake version? Well, for starters, parallel versions of novels has long been a common thing and it is just that the internet of today, has provided a very convenient platform for mass distribution. Perhaps there is pride and honour within these writer's community? I believed that the timing of the release was deliberate, knowing that everyone was dying to be the first to get their hands on the book and therefore what better than just before the official launch date? I won't be surprised if this fake version got millions of downloads. Still, even if we were all duped, I say we still came out the better as it was a good read and mind you, it was just as thick as the real thing. Whoever wrote this must have put in quite a bit of effort into it. Unfortunately, the identity of the author is unknown. I would have loved to give him/her the credit that he/she so rightly deserves. 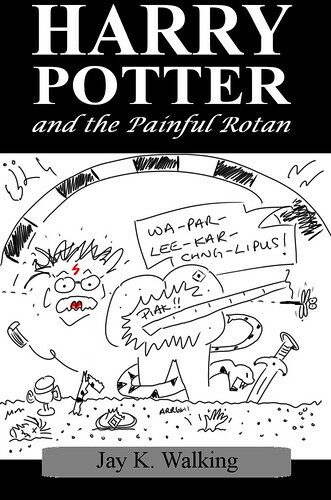 I will talk about both books in tomorrow's entry, which would also explain my design of Harry Potter's 8th Book. Spoiler ahead tomorrow. Be forewarned. p.s. I am thinking if I should upload the fake version for those who are interested to read it. I supposed there is nothing illegal in doing so right? Yes? No? p.p.s. I wonder if tomorrow's entry should be password lock so as to prevent accidentally stumbling into the spoiler entry? Password will be damn obvious and so don't worry about not being able to find it. I will paste the password big big somewhere. UPLOAD!! !what are you waiting for????? Nethia: Liew.... don't so fierce can? iScared.